B-cell lymphomas are hematological malignancies, which develop from B-cells at different maturation stages by the acquisition of genetic changes. These genetic changes are at least in part introduced through somatic mutation machineries which B-cells need to fulfill their physiologic tasks in adaptive immunity. The transformed malignant B-cells are frozen at distinct maturation stages, a feature which aids to their classification based on morphologic, immunophenotypic, transcriptional, and epigenetic characteristics. Overall, the pathogenesis of B-cell lymphomas is assumed to be a multifactorial process to which components of germline predisposition, environmental factors (e.g. viruses), physiological processes, microenvironmental stimuli, and somatic alterations interactively can contribute and which ultimately lead to a clonal evolution of tumor-initiating cells. 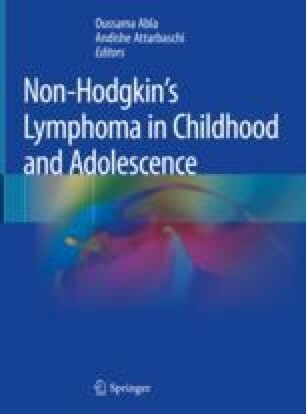 The present chapter will outline key principles and general mechanisms underlying the pathogenesis of B-cell non-Hodgkin lymphomas in children and adolescents. The author’s own work on B-cell lymphomas is supported by the BMBF, the Deutsche Krebshilfe, the Medical Faculty of the Ulm University, and the KinderKrebsInitiative Buchholz Holm-Seppensen. The authors want to acknowledge and excuse to all colleagues, whose seminal contributions to the topic could not be quoted appropriately due to space constraints.